25-May-2001 -- I am Trent Condellone, and I lived in Texas County, Missouri, which is to the north of here - I went to Willow Springs quite a bit over the years. When I saw this confluence was available, I snatched it right up! I went out, 1st visit, on May 18, 2001. I was prepared - or so I thought. The county couldn't provide land ownership information by lat/long and the confluence was close to the property lines. So I got the information about the surrounding landowners and set out - after tromping around everyone's land, and visiting some interesting people, I found out that the people who actually owned the place weren't there! So I dropped off some information at their house, and left. Surprisingly, the doctor who owned the land knew that the confluence was there - his friend is a geologist and pointed it out to him. So it wasn't too much of a surprise when I came calling! We set a time for Friday, May 23, 2001, at 16:30. The land owner was kind, and foresighted, enough to get an old '76 Jeep (guess my Mustang didn't look very good for off-roading to him!). The actual spot on his land was a little ways off the road - about 1/2 mile in the woods. We set off through the 4 wheel trail, came kind of close and started walking about, trying to get a good signal, and find the spot - which was right about where it should have been, near the fence line. 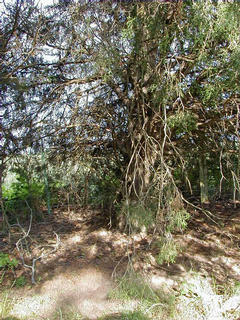 There is an old cedar tree right on the spot. The land owner is the guy who found the exact spot - he provided a great amount of help to me, for which I am very appreciative. They sure did a great job of surveying in the old days - the fence was only a few feet away! The area has woods to the north, a tree line (also the land ownership boundary) on the east, and a field to the south and west. After we took the pictures, we tried to leave - but the Jeep's clutch fell apart! We had to go back down the road and find the parts.... After that we couldn't make it up the steep hill - the jeep wouldn't go - but oh the smoke... turns out the parking brake was left on! Almost back to the landowners house, some ways down the paved road, and we run out of gas.... Good thing he brought his cell phone! Much thanks to the landowner, for his assistance Dr. Shaw, his son, and the Antique Fire Equipment Museum in Willow Springs, MO (stop by and see it if you go there!) for letting the landowner borrow the Jeep! Of interesting note is the enclosed photo of what's left of the old iron ore pit mine, near the site (about 75 ft north). It was used sometime during or (most likely) after the civil war, perhaps even up to the turn of the century. #1: The Cedar tree marks the spot!